Yes, we’ll always find time to talk about engagement rings, because there will never be a shortage of new stuff to come out. As long as women love their sparkle, engagement rings will continue to be popular. But what about the guys? We gush over engagement rings, and even give women’s wedding bands their deserved shoutout every once and awhile, but men can’t be left out of this picture. After all, he needs something that his partner can slide on that finger once the day is here. And if that ring is custom, we’d be willing to bet that he’d be just as excited to wear it as his partner is wearing his or her custom engagement ring. Personalized pieces of jewelry are so special, and there is no other brand out there who can do it quite like Joseph Jewelry. So, we spent some time chatting the company up on their custom men’s wedding bands, and we came up with several reasons why getting something super unique is the way to go. He’ll have lots to choose from. Men aren’t limited to gold and silver metallic bands these days. In fact, we might even say that, for guys, the options for wedding bands are even more diverse than they are for women. They can start with a metal - like titanium or tungsten, two-tone or carbon fiber, and then build from there on their finish (hammered or brushed finishes are baller on their own, but have you ever seen a sandblasted band? It looks awesome!!). There really are so many ways to get creative with rings for guys - this is just the beginning. He can go to the dark side. 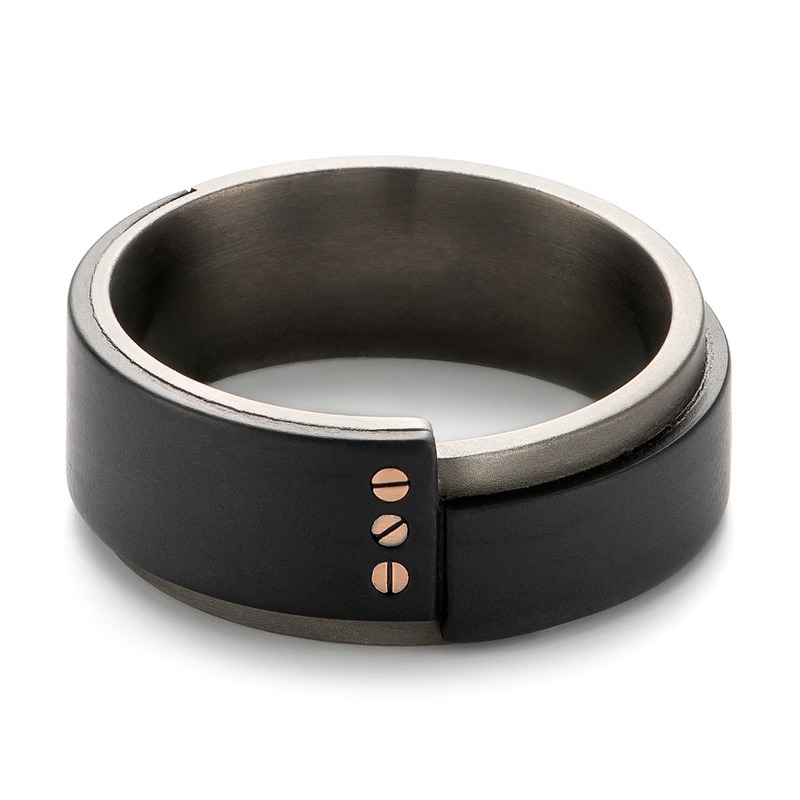 Star Wars wedding or not… Men’s bands that use black material are really trending RN. 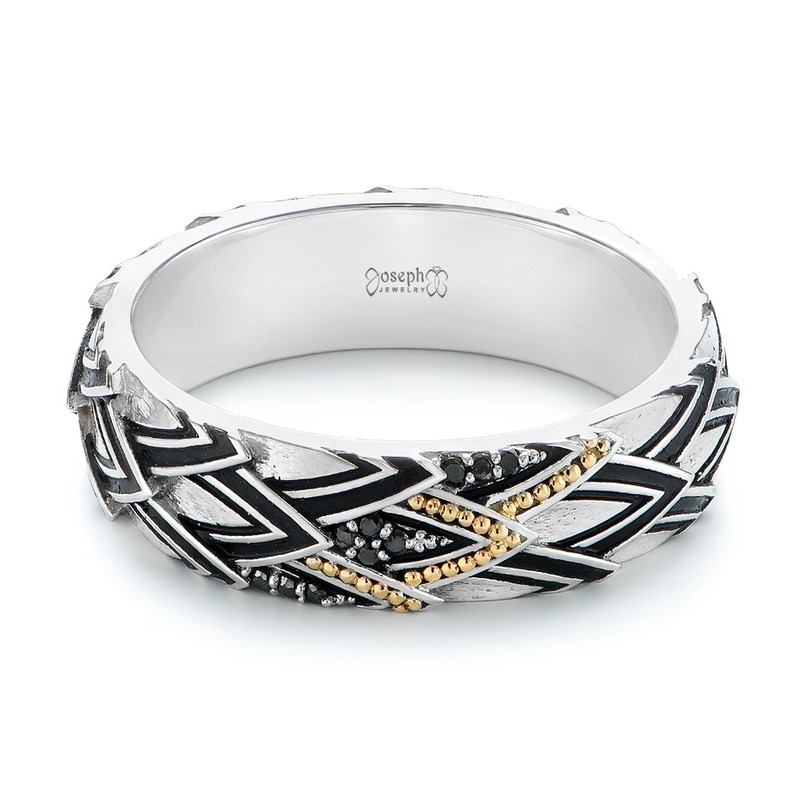 We’re really into Joseph Jewelry’s carbon fiber bands, especially for guys who want to find something a little ‘louder’ than traditional metallics. It’s eye catching and certainly sends a message that ‘I’m married AF’ and proud to be. So, kindly refrain from flirting with me, ladies. They’re also very masculine and edgy. Take this gold and carbon fiber ring, for instance. 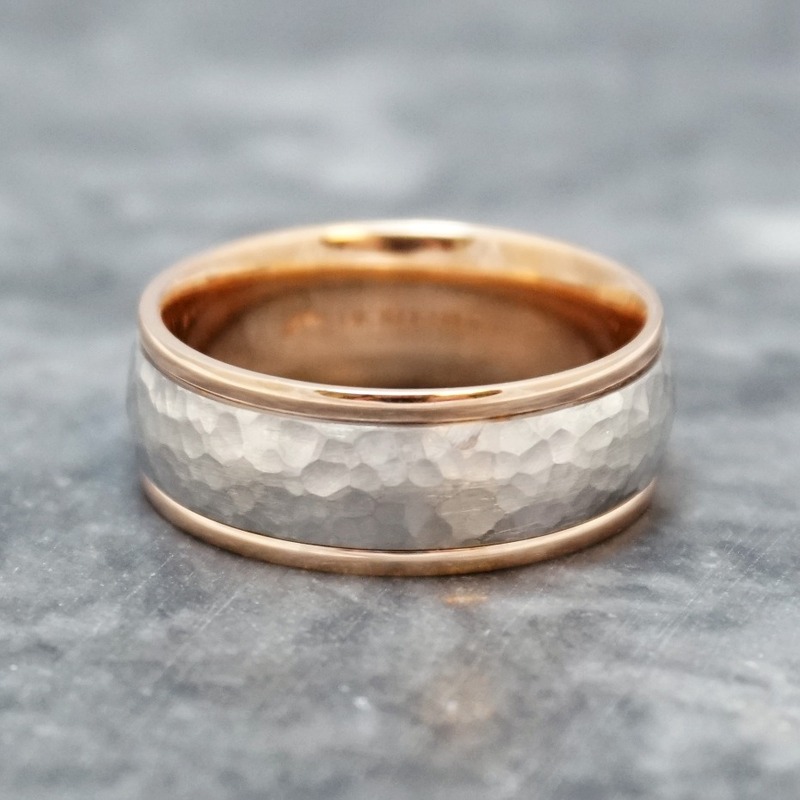 The matte finish is modern and super stylish, and the rose gold screw head pattern can match amazingly with her rose gold band, without looking too contrived or matchy-matchy. He’ll get into this part of planning. And not even just tolerating it. He’ll enjoy the process of finding your rings, if he can make some of the designing decisions. JJ has been in the business of fine custom jewelry and wedding-specific styles for decades, and that doesn’t stop at engagement rings. Some of their coolest projects have actually been for men, who’ve wanted to create bands that (of course) match their fiancé/fiancées style, but also incorporate personal elements to make them happy too! Like a dragon scale design with black diamonds, black antiquing, and yellow gold accents. #GOTgoals? Through Joseph Jewelry’s custom design process, you/your future husband can create pretty much any design. They’ll work with you to clarify your designs ideas, then they’ll create 3D designs and renders of what your ring will look like, and then you’ll be afforded as many times to modify things until you’re 100p happy. Thereafter, they’ll cast your ring in metal and add finishing touches from their talented jewelers. He can carry around a piece of you everywhere he goes. 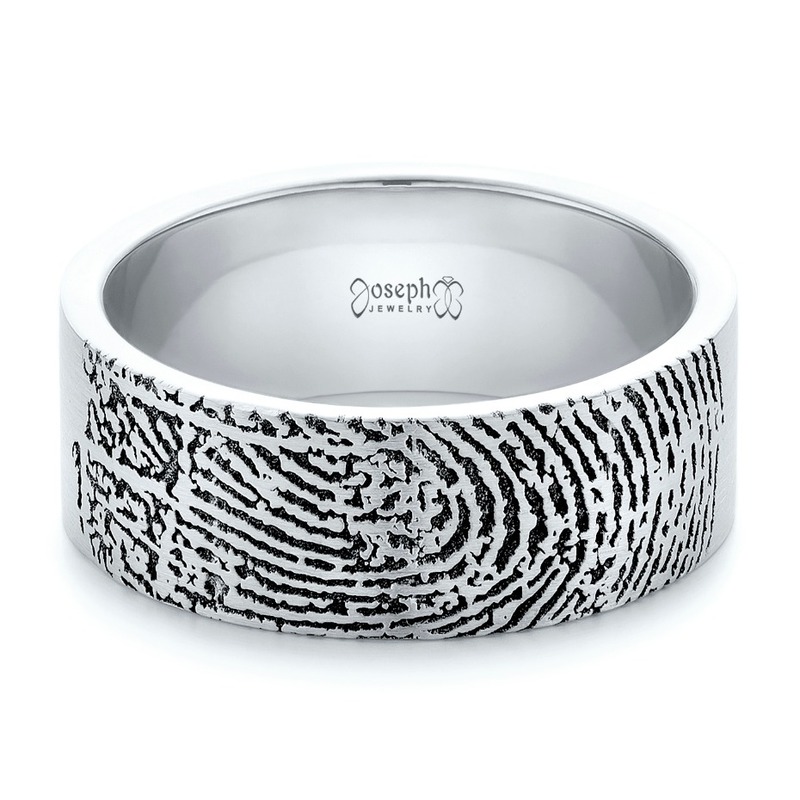 Whether it’s your fingerprint or a custom inscription you write to your guy (to surprise him on your wedding day), adding your own special touches to his band makes the moment you exchange vows+rings even that much more exciting. Especially for the guys who are totally traditional, their classic rings can be upgraded with secret additions - like gemstones or engraving - that only the two of you (and your Joseph Jewelry team of artisans) know about. You can go subtle too… While this design incorporated a laser engraved fingerprint all over the band, you can go with something similar, yet simpler. Like having your fingerprint engraved on the inside of the band. A special gesture that says ‘I Love You, I’m Yours,’ without having to tell the whole world. If they came to your wedding, they already know you’re in love 😍. He’ll love having the support of a team behind him. Joseph Jewelry has one of the largest collections of rings for men that are actually unique, and they make it their mission to help brides and grooms personalize their rings to make them as meaningful as possible, because these are the tangible things that last well beyond the last bite of wedding cake. Even if you or your partner aren’t sure what type of ring or style you’re after, JJ’s expert designers will guide you through the custom design process from start to finish. They’ll show you as many examples and versions of a design you’d like, and they won’t put anything into production until they get your final green light. 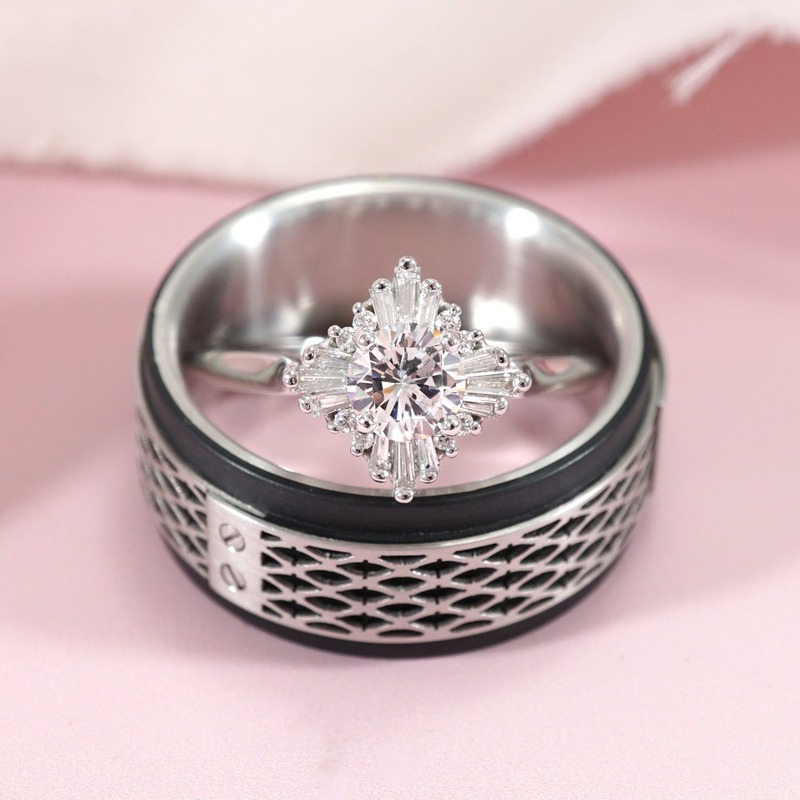 Joseph Jewelry offers the highest level of customer service, and you and/or your guy will work directly with a designer in a pressure-free environment, either in person or online, to create a ring that truly reflects his style and personality. 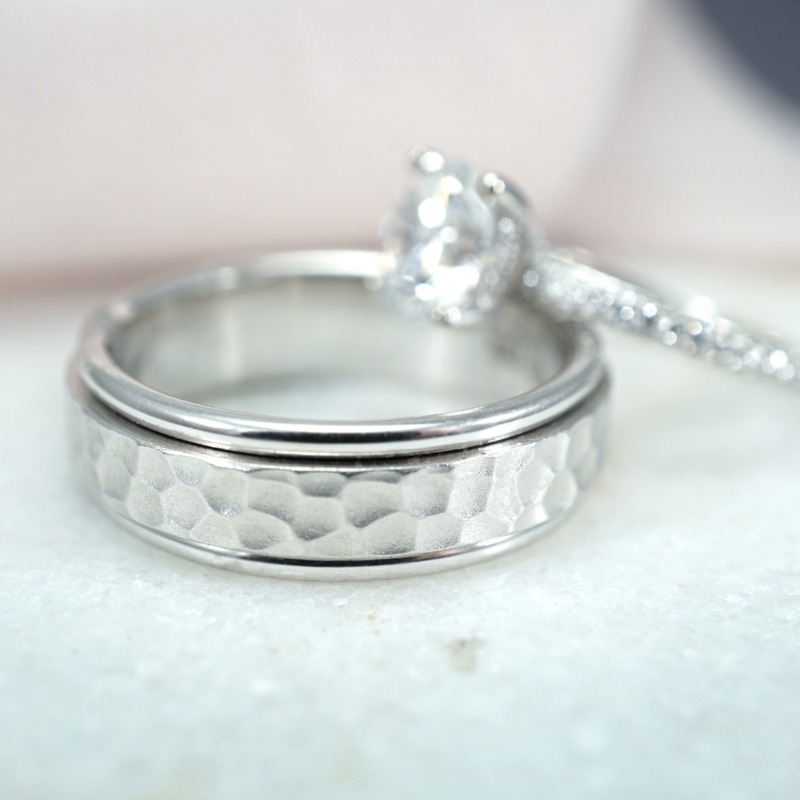 We partnered with Joseph Jewelry to make a few believers out of custom men's wedding bands. As always, thank you for supporting our sponsors!